Marine Consult Limited (MCL) is an independent consulting company, providing technical, managerial and innovative services to the maritime industry in Ghana and beyond. It was founded in 1991 as a 100 percent subsidiary of the Regional Maritime University (Ghana). MCL has over the years, evolved to become more than just a consultancy company delivering specialized services within the offshore and maritime engineering areas but also, offering services across a wide range of other maritime disciplines. We are poised to proactively define the needs of the maritime industry in the sub-region and beyond and develop tailor made solutions to those needs. At Marine Consult Limited, we believe in excellence of service, reliability and integrity, brought on by our combined years of experience and service spanning over two decades. The team, consisting of both marine professionals at the Regional Maritime University in Ghana and others in the wider world, consistently seek to provide quality and impeccable services to our clients which has become the hallmark of the company. Marine Consult limited is constantly seeking to add compatible and competent marine professionals with in-depth knowledge and diverse specialties in the maritime sector to its team with the aim of growing a more industrious and competitive company. While the maritime industry is rich in opportunity, it also provides challenging adversaries in the shape of safety, managerial processes and other technicalities which can only or mostly be solved by experts. Our clients and customers are constantly satisfied and always come back because we make it our priority to dig out the solutions that really work. An esteem Educationist, Capt. Turkson was the Rector of the Regional Maritime University for 13 years where he also served as Principal Lecturer. He brought an impressive working and educational history with him when he joined RMU in 1990. A Master Mariner (D.O.C.1 from the College of Tyneside, UK) with over 15 years sea-going experience in various marine navigation officer capacities in Ghana, Nigeria, Iran, Ethiopia and the UK, possesses an unquenchable thirst for excellence. Among other qualifications, he holds an MSc. Degree in Technical Management of Shipping Companies from the World Maritime University, Malmo, Sweden. Dredging expert among a team of foreign marine consultants engaged by Nigeria Ports Authority to dredge, lay and service navigation marks for ports of Lagos, Bonny/Port Harcourt, Calabar and Escravos/Warri. A member of several technical delegations to the IMO, including those on Port State Control for West/Central Africa and STCW ’95 implementation Committee (Ghana) etc. Navigation Officer (Second Officer) at Niger Line Ltd between 1980 and 1984. Marine Surveyor (nautical) for Flag and Port State Control activities and a Nautical Examiner for Ship Masters and Mates all on behalf of the Ghana Maritime Authority (Ministry of Roads and Transport). attended numerous training of trainer’s courses including consultants training on Total Quality Management and trainings in Business Valuation and Internal Audit of ISO 9000 certified Systems to mention a few. Consultant to develop Quality Management System for some organizations within the sub-region (2006). Quality Coordinator facilitating the development of QMS based on ISO 9001:2000 requirements in the then, Regional Maritime Academy and also responsible for the development and management of the Quality Management System (STCW ‘95) in the Regional Maritime Academy (2000 to present). Executive Council Member, Ghana Society for Quality (2000 to present). A prestigious member of the Institute of Chartered Accountants (Ghana), Mr. Addai Marfo has a Master’s degree in Public Administration and a Bachelor of Arts degree in Political Science both acquired from the University of Ghana. He has extensive experience and considerable expertise in the educational sector and has over the years grown a reputation as being a very committed and competent individual. A simple man who values education and everything associated with it, took his first real job in 1996 as a Research Assistant at the Institute of Economic Affairs. Between 1997 and 2004, Mr. Addai Marfo worked under different capacities at the University of Cape Coast (Ghana) where he was a Part-Time Lecturer for the Department of Business Studies/African Studies, Junior Assistant Registrar (Academic Section), Assistant Registrar (Examinations) and Senior Assistant Registrar (Examinations). Prior to taking a job at the Regional Maritime University, he served as an Academic Secretary to the Ghana-India Kofi Annan Centre of Excellence in ICT and also as Registrar of the Takoradi Polytechnic (Ghana). Today, he diligently holds a position as the Registrar of the Regional Maritime University. Dr. Omani is a professional consultant and has vast experience and understanding in marine technology and electrical engineering, specializing in Ship Science, Control Systems and marine consultancy to mention a few. A very experienced and professional individual, Dr. Omani holds a P.H.D. in Electrical Engineering, MSc. in Control Engineering, a DIC in Electrical Engineering, and a BSc. in Maritime Technology. As the former Head of Research and Consultancy for R.M.U, he consulted on numerous projects in the Maritime/allied industries and also worked on several research publications, prominent among them being the publication on “Modified State Space Approach to self–tuning control with pole assignment” IEE Proc. D. CTA 132, No. (6th November 1985). He has a solid lecturing foundation acquired by working as a lecturer at the Electrical and Electronics Department of the Kwame Nkrumah University (Ghana) and as a Research/Teaching Assistant at the Electrical/Computer Engineering Department of McMaster University, Hamilton in Ontario Canada (1982 to 1996). His enviable lecturing career which span over 2 decades was mostly utilized working under various capacities at the Regional Maritime University. Here, he served as Principal Lecturer/Dean of Studies at the Marine Electrical and Electronics Department (1996 to 2007) and as Vice Principal from 2004 to 2007. Currently, he works as a consultant and on part-time basis for university. Martha Fofo Buadu is a very industrious and hardworking member of Marine Consult Limited who holds a Bachelor’s Degree in Human Resource Management from the Ghana Institute of Management and Public Administration and is also an associate of the Chartered Institute of Purchasing and Supply (CIPS). With over 10 years of accumulated experience, having worked at different offices and under different capacities at the Regional Maritime University, she is an effective team player with strong communications, analytical and troubleshooting skills accompanied with excellent multi-tasking, organizational and well proven administrative skills. Earlier on at the university, she worked as secretary to the Registrar and Director of Finance but is currently an active and diligent member of the procurement team. An excellent team player both in his sports and professional life, Mr. Aryee possesses rich leadership, managerial and interpersonal skills. He holds a Master’s Degree in Transport & Maritime Economics from the Institute of Transport & Maritime Management (University of Antwerp), after being awarded with a Bachelor’s Degree in Maritime Studies at the Regional Maritime University. He is presently a Lecturer at the Ports & Shipping Department of the Regional Maritime University and the Coordinator for the Maritime Studies Faculty Research Committee and Shipping/Port Operations Research Group. Mr. Aryee also has experience working with shipping lines in import documentation and logistics. A management professional and Certificate Mediator with over 20 years experience working with private organizations and International NGOs, Government Commission funded by the World Bank, African Development Bank, Islamic Development Bank, implementing and supervising projects and services, and now, at the Regional Maritime University, where he is one of the sector Directors. He has a wide range of interests in Project management and planning, policies, organizational systems and procedures; Training and Development; Performance and quality Management and non-technical maritime enterprise and strategic management issues. He is a Master Project Manager (MPM), and holds amongst other qualifications, an MBA from the University of East London Business School. Partnership is key in any growing business, and Marine Consult like any other professional company welcomes it. Over the long years, we have established strong and lasting working relationships with numerous companies in the sub-region and around the world. Our aim to achieve the utmost excellence and provide complete servitude to our clients means we choose partners who share our principles/ideas and are the best at what they do. Our partners/clients are; (add partners and clients). Our services can be categorized under either main or others. We prepare the basic designs as well as do all necessary strength and hydrostatic calculations to our customers’ specifications when ordering a floating craft. We prepare detailed specifications for craft, as well as tender documents for final competitive bidding. We evaluate bids for best technical and financial proposals and also offer advice during final contract negotiations. We carry out studies and give technical and economic advice for the rehabilitation of floating crafts such as tugs, pushers, inland navigation vessels, ferries and barges. With a staff comprising of experienced and competent men and women from the engineering and marine navigation fields, MCL is rightly positioned to offer the needed and expert solutions for crafts and vessels under rehabilitation. We have expertise who carry out supervision of engineering works related to ship construction and repairs on behalf of clients. Our experience engineers who are dedicated and have respect for safety and regulations can provide technical and impeccable advice to clients during construction and at final inspection. As the consultancy wing of the Regional Maritime University, Marine Consult Limited have access to a large pool of professional and academic staff mostly constituting the teaching strength of the University. Our consultants have higher level qualifications from reputable institutions such as the World Maritime University, and expertise in IMO regulations coming from active involvement in IMO technical committee sections. The majority of our professional team are experienced captains and chief engineers, with over 30 years ocean going experience with several shipping companies, on bulk carriers, oil tankers, LNG tankers etc, in countries like the UK, Canada, Australia, Malaysia, Singapore, Bangladesh, Nigeria, Iran, Kuwait, Ethiopia, Liberia and Ghana. The company constitute staff who are members of professional bodies like The Royal Institution of Naval Architects (UK), Ghana Association of Ship Surveyors and The Institution of Engineering and Technology (UK) etc. Since its inception in 1991, Marine Consult Limited together with its strategic partners have been involved in several high profile projects in both the Maritime and allied industries within the sub-region. The Tema Oil Refinery (TOR) transports oil to various destinations through the Northern region of Ghana via oil tankers with varying capacities between 11,000 and 43,000 litres. In 2008, the Bulk Oil Storage and Transportation Co. Ltd (BOST) contracted Worcon engineering Ltd with Marine Consult Limited as the consulting agency for the construction of a wet leg at Akosombo to transport oil in Barges (700,00.00 litres, minimum capacity) to storage tanks at different location (Tamale, Bolgatanga) in the North. In that regard, a dry leg will be constructed at tema to initially transport the oil from TOR to Akosombo. The goal here was to facilitate a smooth transportation of the oil, reduce cost and prevent accident that frequently occur with tanker truck oil transportation. The project which commenced on December 2008 and was planned to be completed on February 2010 was valued at US$ 33,000,000.00. 2 No. Fuel Barges each of minimum capacity, 700,000 litres. 1 No. Pusher Boat (23 meters in length). 1 No. Floating Dock, 55 meters, 500 tonnes. Buildings (office block, workshop, warehouse, bungalows and generating room). Piping works (anti fire and discharge line). Irrigation works (water supply to BOST depot). Civil works (access roads -700m, slipway and dock, laying of pipelines at Debre depot). Ancilliary facilities (jetty and harbor facilities). In 2008, the Regional Maritime University in partnership with International Transport Federation acquired a full mission ship simulator for practical and other academic purposes at the university. It was under the supervision of Marine Consult Limited that the procurement, installation and construction of the simulator was safely and smoothly undertaken. MCL was also in charge of design specification, preparation of contract documents, evaluation of bids and awarding of contracts. The cost of the project was estimated at US$ 700,000.00. In 2010, PSC Tema Shipyard with the backing of the Ghana Ministry of Roads and Transportation engaged the services of Marine Consult Limited to draw a master plan for the medium and long term development of their shipyard. Under our keen supervision, the project was successfully completed in 2011. The Volta River Authority in 2008 engaged the services of Marine Consult Limited for the rehabilitation of cathodic protection system for steel piling at Efasu lagoon/docks for the Osagyefo barge. MCL was charged with supervision of the project and final inspection upon completion. 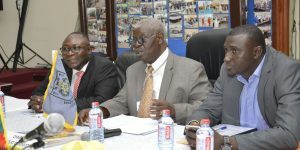 Over a period of 1 year, between 2008 and 2009, the Minerals Commission branch of the European Union contracted the consulting wing of the Regional Maritime University (MCL), to conduct a survey on salt production industries doing business on the Songhor and Keta Lagoons. In the contract, it was proposed that, mini harbors and jetties should be constructed on site to facilitate the bulk transportation of the salt to neighboring countries. The Ghana Maritime Authority is responsible for the training and certification of Ghanaian seafarers in accordance with the International Convention on the Standard of Training, Certification and Watchkeeping for seafarers (STCW). In 2008, GMA acquired the services of Marine Consult Limited to set up quality management systems to ISO 9001/2000 standard. The estimated value of the project was US$ 20,000.00. In accordance with the contract dated 23rd June 2008, the Ghana Maritime Authority engaged Marine Consult Limited to provide training for boat operators at six specific landing stations on the Volta Lake. These stations were Dzemeni, Dambai, Kete Krachi, Kpando Torkor, Tapa Abotoase and Yeji with the value of the project estimated at US$ 45,000.00.
Review all available data on activities relating to the education and training of boat operators on the Volta Lake. Hold discussions with all stakeholders in the boat operation business including boat owners, day-to-day boat operators and their association, relevant district assemblies and other authorities so as to enable Marine Consult develop appropriate programs to be adopted for training. Submit the programs so developed to the Authority (GMA) for approval. Ensure that the training to be provided satisfies current needs. Conduct training in accordance with the approved programs. On completion, evaluate trainees and submit names of those successful to the GMA for issuance of Certificate of Proficiency. At the end of the project, participants and client alike showed approval and contentment which was evidently a reflection of the company’s hard work. Between 2006 and 2008, the United Nations Development Program (UNDP) in conjunction with the Ministry of Manpower, Youth and Employment engaged the services of MCL to train a large number of Ghanaian youth in the acquisition of maritime technical skills for the international market. Under the close supervision of MCL, the project valued at US$ 75,000.00 was executed smoothly without much hitches and client/participants expressed optimum satisfaction. With our vast pool of professionals and technical staff, the Regional Maritime University/Marine Consult Limited under the request of the Tema Oil Refinery (TOR), provided one personnel as instrumentation supervisor to perform supervision work on the piping and instrumentation construction on the RFCC project. The program which was undertaken between 2000/2003 and valued at US$ 30,000.00 now allows recovery of additional refined products from previously wasted residual fuel oil. The project also allowed for self-sufficiency and increased export capacity in LPG and Kerosene. Over a 3 years period ( between 2007 and 2010), the UNDP/Ministry of Manpower, Youth and Employment attained the services of Marine Consult limited to draft key policy guidelines for youth employment in the maritime sector. The project was aimed at inclusive growth through the creation of productive, accessible and sustainable employment and specifically targeted the Maritime sector of the economy to breed more opportunities for the large number of unemployed Ghanaian youth. The value of the project was estimated at US$ 40,000.00. Please contact us on the addresses and telephone numbers below for all your maritime solutions and more.